The Microsoft Surface Go is a 10-inch Windows tablet that you can get with a keyboard cover and an active pen. 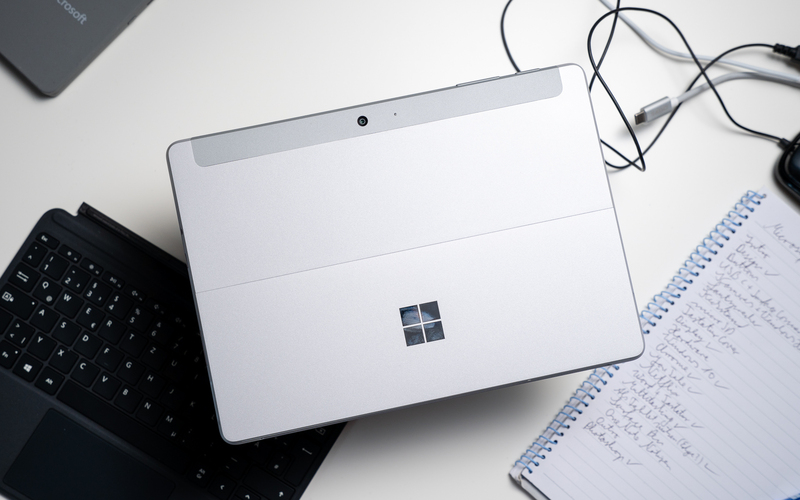 Even though it is a cheaper and smaller version of the Surface Go, the design is almost identical. With a price starting at 399 US Dollars we get a high-quality magnesium body, solid internal hardware, and professional accessories. Here is everything you should know about the Microsoft Surface Go. The Microsoft Surface Go looks like most Surface tablets. In fact, its design is almost identical to the much pricier Surface Pro. However, in this case, the corners are rounded a bit and not as sharp. It has a full magnesium body, is 8.3mm thick and weighs 522g. On the back, there is an integrated kickstand that can be opened quite far. There is a micro SD card slot underneath and on the sides, we get the Surface connector and a USB C port. Other features include an IR camera so you can use Windows Hello and facial recognition to unlock the tablet. There are a 5-megapixel front-facing camera and an 8-megapixel main camera as well. With its 10-inch display, the screen is much smaller than the Pro versions. But it has the same 3:2 aspect ratio and it is a full HD panel with a resolution of 1800 x 1200. The screen is fully laminated. Inside the Surface Go runs an Intel Pentium Gold 4415Y SoC. That is a dual-core processor with both cores clocked at 1.6GHz. In addition to that, we get 4GB or 8GB of RAM and a 64GB eMMC storage or a 128GB SSD. As you might expect, the Pentium Gold processor is much faster than the old Intel Atom chips. However, it also is much slower than a Core m3. The tablet runs Windows 10 in S Mode out of the box. However, you can switch to Windows 10 Home at any time and at no extra costs. As usual, we get a couple of interesting accessories for the Surface Go. The most important one is the Type Cover. This is a keyboard cover that connects magnetically to the tablet. Like with the bigger Type Cover, there is a magnetic bar so you can angle the keyboard a bit. It features a touchpad as well. The other accessory is the Microsoft Surface Pen. Actually, it is exactly the same pen we know from the Surface Pro already. And it works the same. There are a couple of interesting alternatives to the Microsoft Surface Go. A direct competitor is the much cheaper Lenovo IdeaPad D330. While its build quality is not as high-end, it features a 10.1-inch display and Intel Gemini Lake processors. The performance should be very similar, but probably not as good. We get a keyboard dock and you can use it with an active pen as well. Sadly, the cheapest version has an HD resolution only. Another direct competitor is the Chuwi SurBook Mini from China. It has a 10.8-inch display with the same 3:2 aspect ratio, a full HD resolution and a bit slower processor. However, Chuwi copied the design from the Surface series. Because of that, it is almost as nicely build. And it is much cheaper at around 300 Dollars including the keyboard. One bigger but similar priced alternative is the Acer Switch 3. It features a 12-inch display and an almost as powerful Intel N4200 quad-core chip. The Microsoft Surface Go went on sale almost worldwide in August 2018. In the US, prices start at 399 US Dollars and it costs about the same in Asia. However, in Europe prices start at 449 Euros. The Microsoft Surface Go is a great Windows tablet. It features a nice full HD display, a good enough performance for office work, and a very premium build. Additionally, you can get it with an outstanding Type Cover and a great Surface Pen. However, I think the Surface Go is too pricey for what it can offer for most.